Today's announcement is that Yes Dear is offering FREE sleep aboards for the night prior to charter. Yes Dear is a 58-foot Simonis catamaran with a crew of two. This luxury charter yacht is fully air conditioned and accommodates up to 10 guests in 5 cabins each with Queen berths and ensuite head with shower and electric-flush toilet. Two of the Queens are "slim" Queen berths as they are 58" wide (Queens are 60" while Full/double size = 54"). This is a great yacht for couples or families! Chef Katie is an award winning chef and Captain John is now a Dive Master offering SCUBA diving for certified divers. 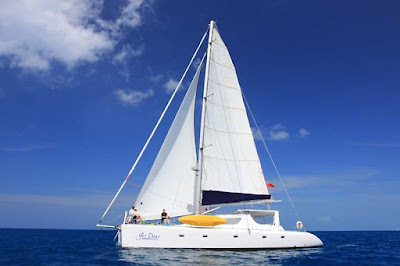 Yes Dear has a 16-foot dinghy with 70HP motor, waterskis for kids and adults, tube, kneeboard, wakeboard, 2 two-person kayaks, 2 standup paddleboards (SUPs) snorkel equipment, floating mats, giant floating flamingo, noodles, TV/DVD/CD in salon, hammock, underwater camera, onboard WiFi where available, registered BVI fishing vessel, etc.